This page provides information on IT matters of specific relevance to SoMS staff such as access to shared servers, and management of data. If you have technical issues with your computer, network connections, printing etc, please contact the university's central IT service on ext. 51333 or at itservicecentre@unsw.edu.au. What’s the fuss about long file names? SiMS stands for SoMS Information Management System. It holds information on SoMS staff including their contact details, work group associations, supervised postgraduate students and progress reviews. SiMS is available to all SoMS staff and postgraduate students via a zPass login. To access SiMS, visit https://sims.med.unsw.edu.au/. SoMS staff have access to a shared file server, providing secure data storage and effective sharing of information within a defined workgroup. This server is known by various names, including the "UNSW File Service", "OneUNSW", the "J drive" and the "I drive". These names all refer to the same thing. Each staff member is given permission to access specific folders on the server according to the workgroup they belong to. If you have not been granted permission to access the folders you need, please complete the SOMS information systems access form. For information on connecting to UNSW shares via VPN, please refer to the UNSW IT home page. If you are not logged in via a UNSW SOE machine, when you connect to a network share, enter your username as ADUNSW\zXXXXXXX where zXXXXXXX is your zID. Your Home drive (H:) is connected automatically if you have a UNSW SOE machine, otherwise you can find connection instructions on UNSW IT pages. Workgroups within SoMS that need to store active research data have access to shares on the Active Data Server colloquially known as R drive. Members of workgroups using R drive will automatically gain access when they are given permission to access the general shared file server mentioned above. All new users of the Server will need to manually connect the drive in order to use it for the first time. => Please refer to these instructions if you are unfamiliar with connecting to a file server from a Mac or Windows computer. => If you are still having difficulties please contact IT Service Desk x51333. 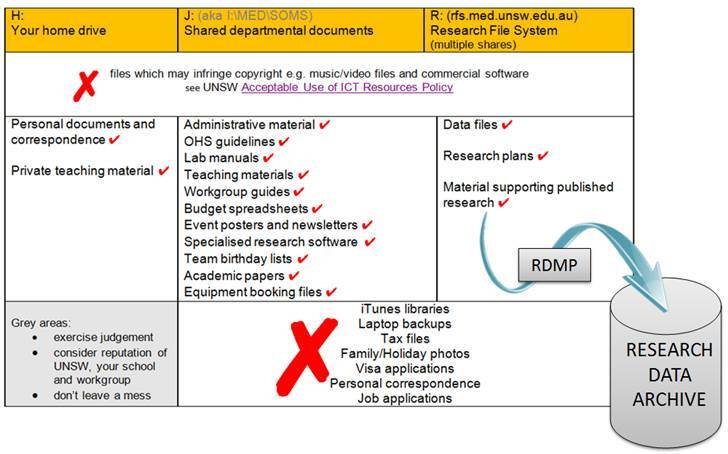 The UNSW Data Archive site covers the process of writing a RDMP (Research Data Management Plan) and applying for storage in the Research Data Store. 3. don't leave files/folders unlabelled or under-labelled: "New Folder" "data" "images" are insufficient. Note: the UNSW Data Archive is case-sensitive ie it sorts file-names ABC...XYZabc...xyz rather than ignoring case as under Windows/Mac. So if you are "sloppy" about typing then files and folders will appear in a different order in the archive than they do on your local server or workstation/laptop. The long file name (LFN) issue may also be referred to as the (long) file path issue or the MAX_PATH issue. Software programs, including operating system functions usually look at the complete name of a file, which includes its location within the system. So the file mydata.txt you see on drive J: in folder Experiment12 has complete file or path name J:\Experiment12\mydata.txt (26 characters). 1. Your program has a default folder J:\<250charactersinhere> and you create a new file, which will have the name J:\<250charactersinhere>\newfile.xls which comes to over 260 characters. 2. You have a program which constructs a very long file name based on input data (eg with scientific parameters) and/or nests this inside a deep hierarchy of folders. Depending on how well your software is written, it may warn you, or it may simply be unable to deal with this situation and fail without telling you. This can be especially dangerous in case (3) above, where you may be copying/moving thousands of files at once, and losing all those with long file names. An extra wrinkle on this problem is that the drive letter may stand in for a long network name like \\ad.unsw.edu.au\OneUNSW\MED\SOMSRES\SOMSR17 which is 44 characters, not just two letters J: ! Someone copying or reading/writing your file may be doing so using this long network name and add 42 characters to the length of the file name: enough to take it to more than MAX_PATH. Your back-up or archive software may also be unable to deal with LFNs and so you may not actually be fully backed-up. The message is that while your files might be OK on the server or disk you use today, this may not be the case if you have to move, back-up or restore the files. You should be aware of the worst-case scenario of someone manipulating your files with old software, or in a way that makes your file path longer than their MAX_PATH. => Given the potential length of server paths at UNSW, I would stick to drive-letter pathnames of 210 characters or less. 2. When naming folders or files based on dates, use YYYY-MM-DD (or YYYYMMDD) format consistently. J:\September 12, 2005 is very wasteful in character terms, and does not sort in alphanumeric=chronological order as J:\2005-09-12 does. 3. If you have a lot of information in a folder of file name, consider putting it inside a text file in the folder. 5. You can temporarily work around LFNs by storing a folder hierarchy inside a zip archive. NB you will have to make sure that you unzip it in a folder that works within the local MAX_PATH limits. Folders may be scanned for long file names using utilities such as Long Path Finder (Windows). You may encounter issues on servers with a name generated by Windows DFS (Distributed File System), and should work with the “real” server name when bulk-copying files. Windows has a limit of 32,767 characters on NTFS if the full \\servername\folder name is used (with each path component - folder or filename - up to 255 characters long); Linux is limited to 4096 characters. However you cannot assume, without appropriate testing, that a program manipulating the file has a data variable big enough to hold the full name.